I like to know what the trends are in e-Learning. I checked 20 posts on trends and selected the 12 trends that are mentioned most. Here they are, from large (most mentioned) to small (least mentioned). 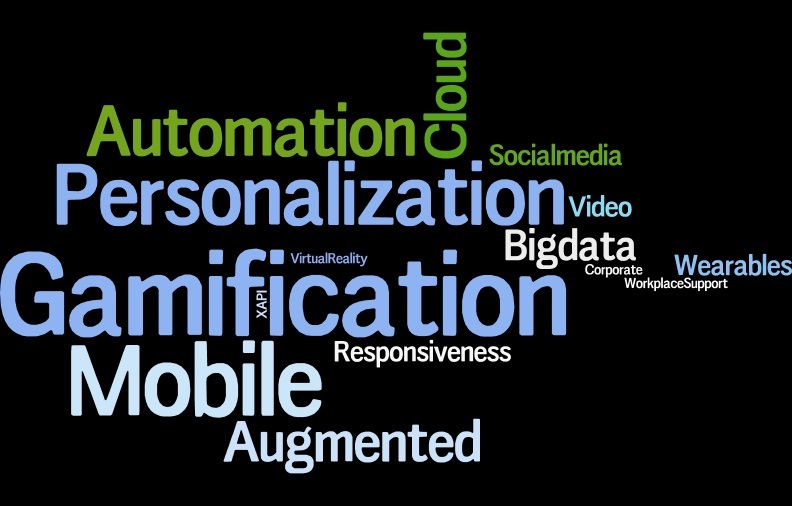 Gamification is the most mentioned trend. It is about applying game thinking and game techniques to e-Learning. It sounds cool and people really want to ride the wave of success of online games, but I have to say that I’m quite critical about applying this successfully into e-Learning. There are two forms of gamification: serious games and adding game elements to learning. These are real online games but with a goal that goes beyond entertainment. They can be powerful, engaging and full of learning. The big but is the price tag. Developing a serious game for less than $ 100.000 is not possible. Not many organization can afford this and if you can you would have to ask yourself if you will get a return on this investment. Adding game elements like leader-boards (who did best, who did most) is much more affordable. But this will only engage a specific and small group, making engaging learning experiences is much more effective in my mind. Duh! Of course is mobile learning a trend, people are using their phones and tablets all the time and for learning purposes as well. The trick is to add value, there is no added value in running a default course on a smart phone. You have to develop specific courses for mobile, taking into account the way people use them and the screen size. And it only ads value if you are able to use the specific features of a mobile phone like location and the camera. Yes here I agree completely. I wrote about this before. The learner is taking control and it is not just about making a learning experience more personal. It is about the changing role of the L&D department. We have to facilitate individual development instead of managing corporate learning goals. That is a big difference. Bloggers give this label to two different trends. 1. Generating automated content or 2. adjusting the content to the preferences and needs of the learner. I’m not so sure about the first application, we have a long way to go there. The part of using Artificial intelligence, location, context, big data and all these things to make learning more personal and effective is in fact the ‘holy grale’ of the next decade. By getting to know your user like google does (Big Data) and applying all these techniques it will become possible to present the learner the right information just in time. But at the same time I hear and read a lot about this, but there are not many useful applications of this yet. Augmented reality means that you put an interactive layer over the real world. Devices like google glass and the smart phones enable this. You look at the world through your device and the app add an interactive layer on top of it that can give you either appropriate information or guidance. It is like context sensitive help in the real world. Successful implementations are already there. For example an app that will add historical and touristic information when you like at a building, a painting or something like that. Applications in learning are still limited. I saw some cool ones to help out mechanics who had to do repair and maintenance. But for every day learning I haven’t seen much useful applications. But this context sensitive learning will get more and more applications. This will be huge, but we need the vendors to make this possible. Big data is like playing Google for learning. By tracking and tracing activities you can target someone with the right information in the right form. You need a lot of data and tools that will help you out. I will try to make this more concrete with an Easygenerator example. You can track and trace learners results through Easygenerator. We do that via XAPI. The result is a huge database with results of many learners. We use this data to report results, but we can analyze this data as well. For a learner this would mean that we can discover his preferences for certain type of courses (for example video based content vs text based content). We can take these preferences into account when presenting new learning materials. The same goes for topics that they are interested in and much more. The other application is for the author. Based on this database we can give feedback on the usage. For example how many people have read a certain page and for how long did they read it. Or which answers have been given to a question. Indicating if some of the distractors (wrong answers) are drawing to much attention or for example when everybody answers a question correct). We will start adding these big data features to Easygenerator in the second half of this year. No doubt that this is a trend, all software will move to the cloud in the future. It is cheaper, easier to maintain and update and more secure. No doubts about this trend. This is no longer a trend, this is a must have for everybody, all content should run perfectly on all devices and automatically adjust to screen sizes. For the rest see my remarks for the mobile trend. Video has become a commodity. Thanks to the smart phones with the cameras it became very easy and cheap to create a video. Thanks to YouTube we are now used to videos that have less quality. It makes video a cheap and effective learning method. We are talking about google glass, the apple watch and devices like that. These devices are not wide spread yet and applications (like augmentation) are still starting up. Might be big in the future, but not yet in 2016. I was really surprised to see social media in the trends. Not social learning but social media. No trend here, just a part of everyday life as far as I’m concerned. This should be a trend, but it isn’t. The e-Learning industry (the Learning management systems) are still clinging to the outdated SCORM standard. XAPI is the future and should be huge by now, but it is not. This year a new SCORM standard called CMI5 will be launched, it is based on XAPI. It gives much more flexibility, new ways to connect to learners and to let learners connect to each other. But most importantly it frees the learners from the tight boundaries of the LMS. Learning experiences can be tracked wherever they occur and it will open a whole new world. I believe that XAPI is not really catching on because it will break the vendor lock in that most LMS have created. So it is not in their interest to support this. But it will be unstoppable soon. LMS will have to go with the flow, or disappear.